I met my girlfriend, Kat in homeroom of fourth grade ... that's 46 years ago for those of you who have guessed me to be much younger. I'd just moved to NY with family and I hadn't yet met anyone. Kat (or Kathy as I knew her then) and I were kindred spirits from the start. We laughed that each of us had a Dad named Ed and a Mom named Dorothy. We each had dogs ... both were pure-bred collies. Only I had siblings, where Kat had none ... and we each longed for the other's family count. We danced to "Purple People Eater" and made up an ongoing story about kids at summer camp. We kept in touch over the years, even though I left NY just 3 years after moving there, until time separated us just after college graduation. Skip ahead perhaps 15 years or so -- life took us in different directions -- and I read about Kat in the Philadelphia Inquirer. She'd written a book ... something I've aspired to do ... and now was living just 10 miles from me, with her companion (now husband) Paul. Kat recently has been bravely confronting breast cancer. She deserves a special card from her "blood sister"! 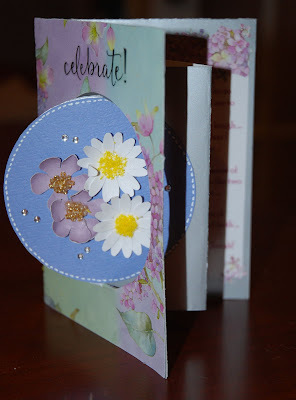 For this card, I used a special template to fold and cut a front "spinning" circle. It opens with a "step" that pulls the front circle medallion inside. For another interesting effect, I used a floral paper with hydrangeas on the front surface, and fussy cut a piece of the floral pattern to highlight the inside of the card. Then, to make it "pop" more, I punched mini-flower cut-outs from the same paper and glued them atop the hydrangea paper for the back (inside) greeting panel. 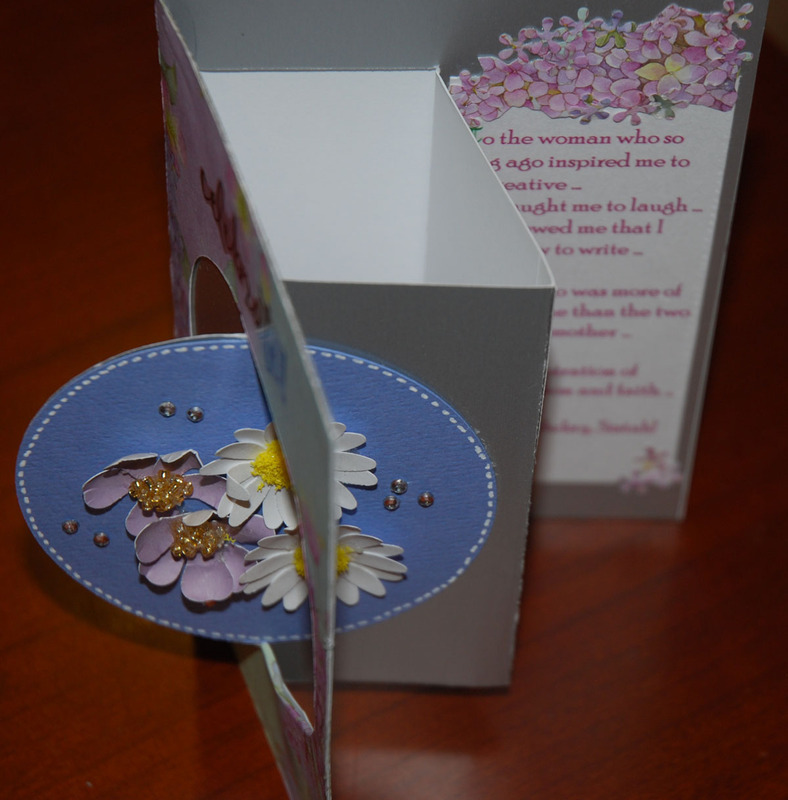 I hope you like the card as much as I do. And if you do, please just add a "comment" up to the Big Guy in the Sky for my friend, Kat. 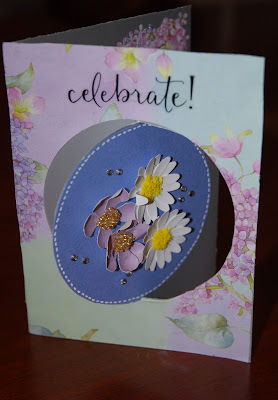 Your card is so cute!! I love the fold!! That is a beautiful card. Where did you find the template to make it? Bonnie, I purchased the template for the spinning card from "Let's Party Hearty". They were an exhibitor at the recent Valley Forge PA edition of the Creating Keepsakes Convention tour. Thanks for asking!